Most of you will be surprised at the stance this animal rights activist takes. She's mad about ranches in Texas that raise big game animals that are endangered or extinct in the wild. The ranches allow 10% of their animals to be hunted for sport. The money from the hunt supports the large ranches and growing populations. Even so, she think this is wrong. 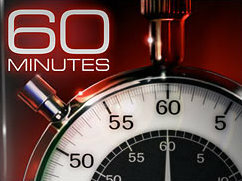 Here is some of the transcript from 60 Minutes starting at about the 6:40 mark. Priscilla Feral is president of Friends of Animals, an international animal rights organization. For the past seven years, she's been fighting in court to stop these rare African antelope from being hunted in Texas. Feral: They're breeding these antelopes, they're selling the antelopes, and they're killing the antelopes. And they're calling it conserving them. They are saying it's an act of conservation and that's lunacy. Logan: You would rather they did not exist in Texas at all? Feral: I don't want to see them on hunting ranches. I don't want to see them dismembered. I don't want to see their value in body parts. I think it's obscene. I don't think you create a life to shoot it. Logan: ...you would rather they not exist at all? Feral: Not in Texas, no. Wow. Later in the piece we hear a little more from her. But for Priscilla Feral, the bottom line is that these animals should not be hunted. She's helped create a reserve in Senegal for 175 orxy and in court, she's winning the legal battle she's been fighting for years to stop them from being hunted in the U.S.
Feral: The future for oryxes is Africa. It's not Texas. Logan: Can the future not be both? Don't they have a greater chance of survival the more of them there are? Feral: In their native lands. Logan: Regardless of where they are? Feral: I don't think you can say regardless of where they are. A Texas hunting ranch is not the same as being in a reserve in Senegal. Here we have her saying to the incredulous reporter, that if these animals can't exist in Senegal, then they shouldn't exist at all. Switching gears, this argument reminds me a lot about the line of reasoning used when we talk about income inequality. Some people would rather that we all be equally poor rather than have some people who are rich, even if having rich people means that the poor will be better off than they would be otherwise. Since some people find the disparity in wealth inherently evil--just like Feral think that hunting these animals is inherently evil--they can't make a compromise with people who believe the gap is an acceptable cost for the increased benefits to all. Do you think income gaps are sufficiently evil that we should abolish them, even if that means less prosperity for everyone? "For if ye are not equal in earthly things ye cannot be equal in obtaining heavenly things; ..."
A few questions come to mind: What does it mean to be equal in earthly things? What does it mean to be equal in heavenly things? Is it desirable or important to be equal in heavenly things? I dislike the idea of forcing income equality. I also worry than income inequality could be a catalyst for violence -- which doesn't excuse the violence, but the possibility of avoiding violence means it's worth thinking about the issue. That is a good point, Bryant. If we forced it, we wouldn't be any closer to being equal in heavenly things, since compulsion won't cause the sort of change in our hearts required to make us celestial beings. On the other hand, enormous gaps in wealth can be used to stir up envy, which could then lead to violence. But the solution to the envy (more Christlike living) would also lead to an increase in consecration which would lead to less disparity. I suppose that is the better path to follow. Great thought provoking post. I really like the book The Majesty of God's Law by W. Cleon Skousen. He talks a lot about the solution to these problems through the mosaic law and how it applies to us in our day. The simple answer is we all just need to be righteous. Easier said than done. I haven't read that book by Skousen. The premise sounds interesting, so perhaps I'll have to check it out. He's certainly garnered a lot of attention with his "500 Year Leap" book.